In 1956 he became a pupil of Kikuo Tesshin Aoki, the eighth headmaster of the Hyoho Niten Ichi School. From 1967 he studied under Tadanao Kiyonaga, the ninth head. In 1976 he succeeded to become the 10th Headmaster of Hyoho Niten Ichiryu. In that year he became a pupil of Iwao Hosokawa, leader of the Shinshu Komyo Buddhist Sect. In 1988 he was awarded with the Medal of the Blue Ribbon of Japan (Ranju Hosho) by the Emperor Showa. 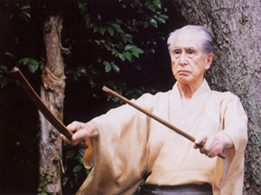 Translations on this web site are from, Imai Sohke : Explanations of Dokkodo of Musashi Miyamoto (The Way of Self Reliance) and Seiho of the Niten Ichiryu. ABSTRACT: For years it has to be said that if one wants to understand Gorin no Sho, one must also understand the Buddhist Sutras. Without this, it is impossible to understand the real meaning of Gorin no Sho and the mind of Musashi. Both Gorin no Sho and the Buddhist Sutras are indispensable to Hyoho Budo. 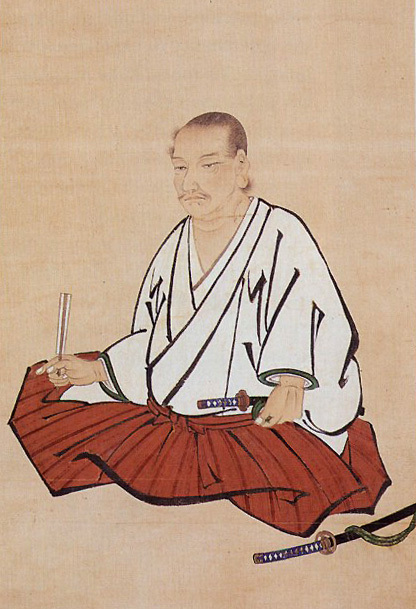 My first teacher of the Niten Ichiryu (Two Heavens as one School) was the eighth head and was an expert on Buddhist Sutras. My second teacher the ninth head Tadanao Kiyonaga was a monk who was authorised to teach Sodo Sect Buddhism. After Kiyonaga Sensei passed away I succeeded to become the tenth head of Niten Ichiryu. At that time I had greatly hoped to enter into Buddhism. I met Iwao Hosokawa. 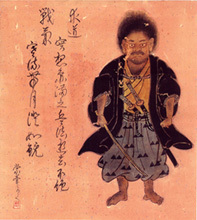 From him I learned about Tanni Sho (Notes Lamenting Differences) written by Shinran Shonin. Forty eight years have now passed by. I have now gradually come to understand the real meaning of Gorin no Sho that heads Aoki and Kiyonaga had tried to explain to me. The following explanation is about the Prologue of Gorin no Sho, Riho (benefit). The Nine Principles, Banri Ikku (Thousand Principles and Emptiness), and Satori (spiritual awakening) by referring to the words and expressions appearing in Gorin no Sho. As successor of the Hyoho Niten Ichiryu, I should explain how highly we regard this valuable book. I would like people to study what Hyoho Budo is through Gorin no Sho. Below is the lineage chart. The line is clear and concise with a specific method of handing things on in practice documentation and artifacts, details of which are not for publication. A case of what we know and for others to perhaps wonder unless they become a part of that very process. Others that are aware of such a process and documentation are Japan's recognized associations such as Kobudo Kyokai in affiliation with Nippon Budokan and Monbusho and Nihon Kobudo Shinkokai. Needless to say any other so called Ha or group could attempt to join such an association "if" they could produce relevant artifacts and documentation to back up their claim and show a living practical tradition that actually related to those documents. Throughout the generations certain students have also been acknowledged by previous Soke during their life leading towards final succession. These have gone on and away from the actual lineage and in many cases have added their own techniques and methods of training. Generally the term Ha or family is used in this case. But this has had no bearing as to who was chosen in finality to continue the line. It goes without saying that HNIR lineage is NOT Hereditary. I should make this clear as looking at the lineage chart of successive Santo family it is coincidental and not heritory with relation to the ryu. Case that holds the Jisso Enman no Bokuto. Even to this day it is possible to establish a Ha with the sanction of the present Soke of a ryu. But it would be have no use unless close contact can be kept with future successors. Because Musashi clearly handed down his Hyoho on the condition that it should stay as it is with no adaptation. The ultimate purpose like any other ryu is to try and bring people together not break and fragment the line. A ha is a "ha", a lineage a "lineage". So for obvious reasons they are not mentioned here on a chart. However they could be seen published elsewhere by people trying to establish links and add authenticity or relevance to a particular Genbudo. Most of all the ryu is "Living tradition". The only way to find anything about it in detail is to join and practice it rather than mere supposition from reading books. Please note well this a Soke genealogy not a menkyo kaiden listing. Only Soke can promote other Soke. Helping Soke with international seminars dose not qualify one as a successor. Neither can succession be obtained from dead people.